Given that it's more or less assured that Apple's going to release an Apple TV with some sort of gaming capabilities, it was surprising but not shocking to see Apple start up a Twitter account focusing on games in the App Store this week. The App Store opened in 2008 and Twitter has existed for several years before that, so seven years seems like a fairly long time to wait to make this move, but better late than never. That said, given how Apple is using their new Twitter account, it's an open question as to who this account is actually for. 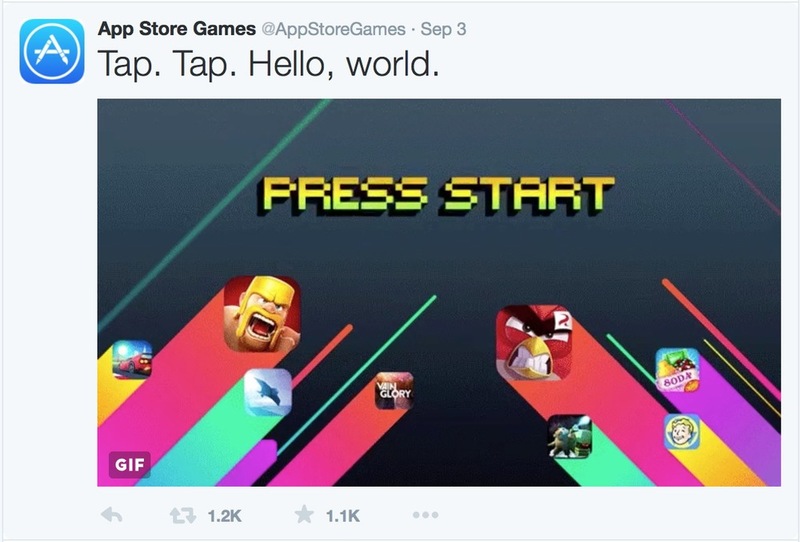 As of the time of this post, @AppStoreGames has 57 tweets since its launch on September 3rd. In addition to the obligatory "Hello, World" tweets and five tweets thanking people like Justin Bieber for following them, they featured twelve games: Ridiculous Fishing, I Am Bread, Power Ping Pong, Hearthstone, Alto's Adventure, Transistor, Walking Dead: Road to Survival, Lara Croft Go, Game of War, Monument Valley, Device 6, and Leo's Fortune. None of these are games that anyone who looks at the main page of the App Store even casually will be unfamiliar with (aside from I Am Bread, a new release already known in the indie game space, and Power Ping Pong, published by Chillingo/EA). Many of these games already have multimillion dollar advertising budgets. Hearthstone has run a series of commercials on television, including during the NBA and NHL finals. Game of War has run over 9,000 ads, including during the Super Bowl; there was a period of time where those ads felt inescapable. One could argue that few, if any, of these games need additional promotion. At a minimum, someone looking to follow this account on Twitter looking for recommendations beyond the front page of the App Store will be extremely disappointed. So what's the problem? Why shouldn't Apple promote games that are popular on its platform? Well, simply, because for every one of those games, there are hundreds which are struggling to get enough downloads to allow their creators to keep making games for a living. Presumably, many people who are following Apple's Twitter account for games have already seen what there is to see on the front page of the App Store and are looking for different recommendations. Even picking one of the games from the second page of the featured list and writing 100 characters explaining why that game is worth a player's time could make the difference between a smaller developer being able to afford to make their next game or not. That's not to say that Apple shouldn't feature blockbusters or big new releases, of course. Is it possible someone who has never heard of Transistor will find out about it from that Spotlight feature? Of course. But it's much more likely that spotlighting that game to that Twitter account is tweeting to the choir, and the fact that they seem to be featuring well known entities exclusively is what's disappointing. The difference between @AppStoreGames and, say, the Official PlayStation Blog, is that the latter does most of what @AppStoreGames is doing, but it also devotes space for a number of indie games, sometimes weeks or months prior to release. I make a point to read that blog closely because I end up discovering a number of games that I might not have heard about from anywhere else. That's a new opportunity that Apple has with @AppStoreGames but isn't yet taking advantage of. One of the things that made the App Store great in the early days was that everyone was on equal ground. In an environment where publishing on nearly any other platform required a publisher, a smaller developer could put a good game up on the store and have a legitimate chance to find an audience. That's how we got games like Monument Valley, Swords and Sworcery, and Ridiculous Fishing in the first place. Now, though, the sheer volume of apps submitted, combined with the gargantuan budgets of publishers like King, EA, and even Blizzard, makes it nearly impossible to surface good games from smaller developers. The best many devs can hope for is that their icon will show up on the second or third page of New and Noteworthy and that enough people will click on it and ultimately make a purchase. This Twitter account provides Apple an opportunity not just to surface some games that would benefit from some extra attention, but also prove to prospective Apple TV buyers (who may themselves be looking at the device to fill a gaming need) that the meme that Apple doesn't understand or care about gaming is no longer true. It's sad that @AppStoreGames accomplishes neither of those things. Instead, we get the same recommendations that we've always gotten. Meet the new discovery, same as the old discovery. And everyone loses in the end.